ü Time is the most important factor relating to an investment plan’s success. There is no substitute for starting early and maintaining regular contributions to your investment accounts. ü Individuals saving 10% of their gross income are often on the bubble when it comes to meeting their retirement goals. People saving 15% are almost always on track. ü Choosing the right allocation between stocks, bonds, and cash is the most important investment decision you can make. ü Diversification among asset classes is the second most important factor leading to investment success. Don’t put too many eggs in one basket. Remember, you can also be diversified from a tax perspective by having taxable accounts, tax-deferred accounts (IRAs and 401Ks), and tax-free accounts (Roth IRAs, Roth 401Ks). ü Minimizing investment expenses by utilizing low-cost investment vehicles such as no-load mutual funds and exchange-traded funds is critical to an investment plan’s success. ü If you try to time the market you will be wrong more often than you will be right. ü The principal cause of change in investment prices is a change in consensus expectation for the future. ü Past performance is no indication of future results. Only future investment returns can be achieved; it is impossible to buy past returns. 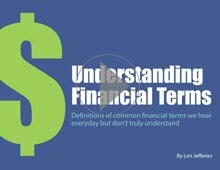 ü When you work with a financial advisor, you are not paying for tips, secrets, or inside information. You are paying for knowledge and reason applied to your specific circumstances. Investors who utilize a financial advisor have generally improved their odds of investment success. However, improving your odds does not mean you will be 100% successful. ü Sometimes we will buy an investment that will immediately go down in value right after we buy. Other times we will sell an investment that will immediately rise in value. It happens, and there’s nothing you can do about it besides stick with your plan. ü Heightened uncertainty is a vastly overused term. There has always been a reason to be pessimistic about the markets, and there always will be. Throughout history, the market has still found a way to thrive, and will likely continue to do so - given enough time.